Training to build muscle mass involves participating in a weightlifting program differs from one you might pursue if you were interested in building strength or power. Instead of focusing on the amount of weight you lift, muscle building programs focus on completing high volume workouts. 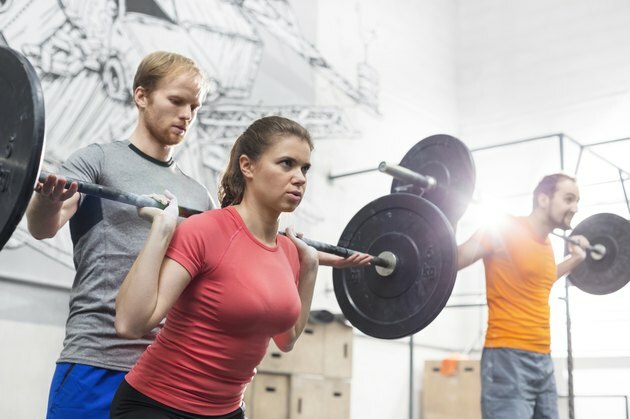 It's not uncommon for weightlifters to be in the weight room and working out for several hours per week. In order to build muscle mass, your weight training workouts must consist of an adequate number of exercises, sets and repetitions to thoroughly overload your muscles. Overloading your muscles results when your weight training sessions successfully break down your muscle fibers, creating small tears. This damage to your muscles is what stimulates the muscle building process, as following your workouts your body takes steps to heal your muscles while increasing their size so they're better able to handle the stress of subsequent workouts. Completing five sets of 15 repetitions is considered a high volume program and is thus an appropriate volume for building muscle mass. Muscle building occurs when you complete exercises at a volume of three to five sets of eight to 15 repetitions. While five sets of 15 repetitions is within the recommended training volume, strength and conditioning professional Dr. Joseph A. Chromiak stresses the importance of incorporating enough exercises into your training sessions. He states that each muscle should undergo a total of eight sets in order to stimulate growth. Therefore, you need to complete at least two exercises per muscle group if you're going to perform five sets of each. It's also important to note the importance of allowing your muscles enough rest. Your muscles need about 72 hours of rest after high volume workouts. Because of the high volume training needed, often weightlifters will split up their muscle groups into separate workouts so that they're not in the gym for too long. For example, you could lift four days per week, completing upper body exercises on Mondays and Thursdays and lower body exercises on Tuesdays and Fridays. This allows you to complete more exercises per muscle group and to thus break down your muscles more thoroughly. Some advanced lifters will lift up to six days per week, focusing on their back and legs on Mondays and Thursdays, their chest and shoulders on Tuesdays and Fridays, and their biceps, triceps and abdominals on Wednesdays and Saturdays. Power Systems: Are Multiple Reps Required for Hypertrophy? How Often Should I Do a Circuit Workout? Can I Do a Full Body Workout Everyday?